Get affordable Security Camera Installation on City of Industry, CA and CCTV equipment with commercial quality and 2 years warranty. Most of our competitors are installing different brands of DVRs and cameras, with so many brand is difficult to become an expert in all that products. Most of this security camera products are not UL listed, what this means? UL Listing means that UL has tested representative samples of the product and determined that it meets UL’s requirements. These requirements are based primarily on UL’s published and nationally recognized Standards for Safety. Protection4Less have been using a few brands of security camera equipment; all this brands are UL listed. These brands have commercial quality: the product is going to last many years with excellent electrical and physical design. Protection4less has the newest and most up to date security camera technology; we install our products with a full 2 years warranty. 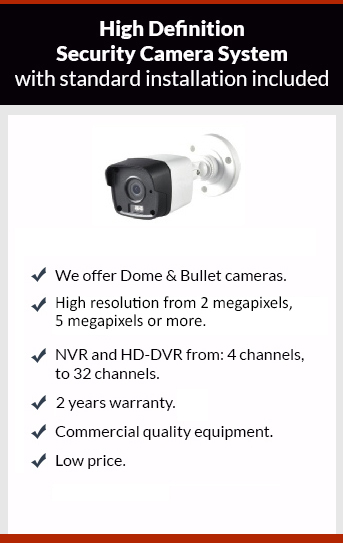 We always strive to provide the best security camera equipment at a low price. Enjoy with us a free expert consultation; we always answer all the questions of our customers on security camera products and installations. Give us a call to get your free estimate.